When Mercedes-Benz launched what were termed the ‘new generation’ cars in 1968, perhaps unsurprisingly, the values they espoused were of a familiar, conservative nature. Yet in its own way, the /8 (or Strich Acht – a term employed to denote the model year), was itself something of a revolutionary. Strich Acht, in W114 (six cylinder) and W115 (four cylinder form) would, in conjunction with the larger W108 saloons, spearhead Daimler-Benz’s renewed offering into a fast-approaching 1970s – a decade which would see the revitalised West Germany become an economic power to be reckoned with, not only within the nascent European Economic Community, but upon a Global stage. Daimler engineers worked incrementally and with great care in those halcyon times, and while the modish 1959 Heckflosse (or Fintail) had become rather dated looking as the ’60s drew to a close, its essential concept remained sound. Headed by Sindelfingen’s legendary experimental chief, Béla Barényi, W114/115 was created by Mercedes engineers as a logical progression of essential Heckflosse themes. The ‘new generation’ cars would sit upon a wholly new platform with modified wishbone front suspension and an entirely new semi-trailing arm rear suspension design, marking the end of Daimler-Benz’s long-held allegiance to the swing axle. The usual mix of durable in-line fours (petrol and diesel) and sixes coupled to Mercedes’ own manual or automatic transmissions provided motive power. Styling, which closely reflected that of the proto-S-Class W108, was led by Paul Bracq, under the overall supervision of long-time Mercedes design chief, Friedrich Geiger; Bracq’s team producing a refined distillation of the larger saloon silhouette, which married a strict formality with an almost Calvinist rectitude. Eschewing the Fintail‘s mild flirtation with Americana, the new generation arrived with a resolutely Swabian bearing. Pared to near-invisibility, the /8’s appeal chiefly lay in its fastidious detailing, supreme build integrity and peerless durability. Safety too – the W114 developing Barényi’s ‘safety cell’ theories further, with designated crumple zones, a collapsible steering column and deformable interior fittings. While at first glance, Strich Acht appears ruthlessly shorn of its predecessor’s sober frivolities, yet not only is there an essential correctness to the car’s forms, but a richness in the relationships between the volumes, the subtle inflections upon the surfaces, the scribed from solid shutlines and the considered decorative garnishes. Just as the XJ6 from the same year would become the definitive Jaguar stylistic testament, the new generation in its own way comes almost as close to perfection – there being nothing to add and nothing to take away which would in any measurable way improve upon it. For all its perceived visual blandness, it was, certainly by Mercedes’ standards, a tremendously accomplished piece of work. The W114’s interior was also a step forward. Closely resembling that of the larger W108 series in conception, it marked a further shift from the Americana of the previous generation cars. A model of clarity, sound ergonomics and soft touch, indestructible plastics, the Strich Acht cabin was a richly austere place to travel. The following year saw the introduction of a coupé version, powered exclusively by six-cylinder power units and incorporating the pillarless DLO which Daimler-Benz customers had become accustomed. While not entirely Sindelfingen’s finest stylistic hour; its canopy perhaps a little too severe for such an indulgent product, it was nevertheless an elegant shape. While a number of estate versions of the Heckflosse were built by the factory, no official utility version of /8 was made. However, Daimler-affiliated coachbuilders, Binz, produced a number of estates, as did Crayford in the UK, illustrating to the management in Stuttgart-Untertürkheim that a market for such a vehicle existed – although it would take another generation for this to be made flesh. In 1973, Strich Acht received its first and only facelift. In time-honoured Mercedes fashion, this would be the most perfunctory of visual massages, with few skin panel alterations taking place. A wider grille, repositioned headlights and the addition of ribbed tail lamp lenses being the most obvious changes, while the front quarter lights were deleted and a modern four spoke steering wheel was fitted. Three years later, it gave way to its better-remembered, W123 successor, a car which faithfully reflected the /8 theme in modernised form, maintaining the same deeply conservative values in a more refined, even more durable fashion. But its easy to forget how successful the W114 became at embedding Mercedes’ principles of quality and integrity amongst perhaps the toughest customer base of all. Because while it played the shrinking violet to perfection, this was a quality car in every respect, apart perhaps from rust protection. And while it has since been comprehensively overshadowed by the later W123, /8 represents arguably, an ever greater achievement. 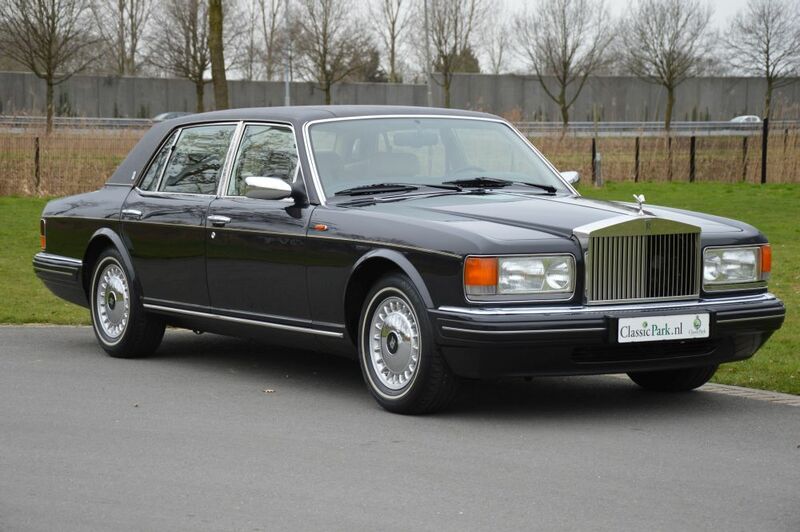 Unlike the W123, which laboured under a slightly baroque aesthetic, the Strich Acht to this day carries with it a sense of modernity, owing one could argue to its more studied restraint. Indomitable, steadfast, dependable, reassuringly expensive. These adjectives embody generations of mid-sized Mercedes. But with these virtues came also accusations of sterility; of cold competence, of a car to be respected, admired but not really loved. Certainly, history has not accorded W114 the warm embrace its descendants regularly receive, but in 1968’s ‘New Generation, we can see the beginnings of the vertical homogeneity, horizontal affinity principles which would serve Mercedes so well in the decades to follow. In 1970, the West German Department of Transport ruled that all licenced taxis would henceforth be painted ivory (RAL-105 officially). By then, most of West Germany’s taxi stock consisted of W115 diesels and it is this shade of off-white (or beige) which possibly colours most people’s perception of the car. Handily dismissed either as a ‘Berlin taxicab’ or the archetypical drearily Teutonic middle-class saloon, the /8 might have not have been exciting, but it was the car that cemented the three pointed star in the firmament as a car to take you to the moon and back again. Nowadays, not every German taxi carries the star of Sindelfingen upon its prow. It’s comparatively easy to understand why. With grateful thanks to CB. © Driven to Write. All rights reserved. I write while listening to the US Mid-terms results coming in, and a commenter says of Marmite Trump: “He gets plenty of details wrong, but does the big things right.” The /8 managed both. Now, it might still be THE taxi in Germany, but in non-metropolitan France it’s long been replaced by the Viano: people travel by rail with so much more stuff, especially with children in tow. The other Eurovans don’t get a look-in. 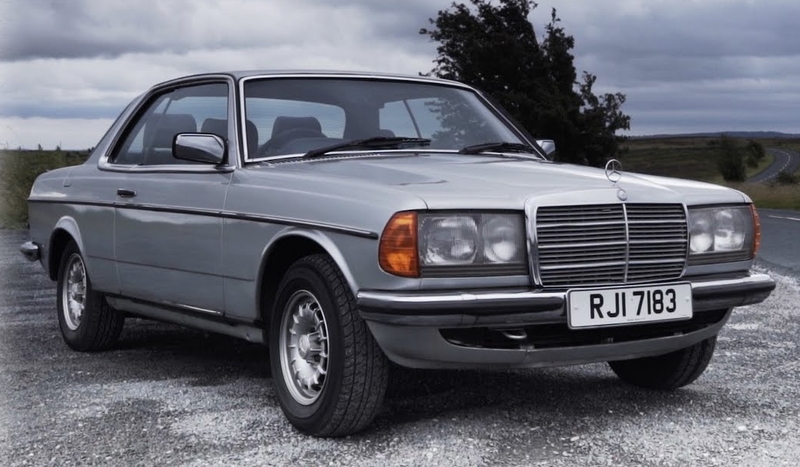 It was also replaced by the 190E, a model which brought MB ownership within reach of a slightly less affluent market — and attracted the fleet buyers keen to please their aspiring mid-managers and best sales reps. Your coupé (and I always coveted one) has the later double front bumper, which complicates the lines but is probably a safety addition. The CLK was an attractive successor. The oddity was the CLS, which struck me as gouging into the /8 market, like a self-harming teenager. 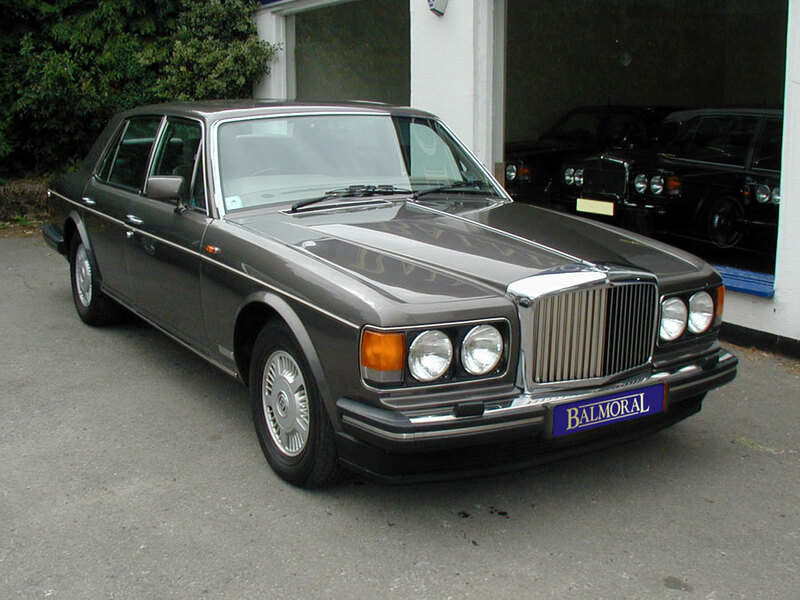 In addition to the standard W114/115 versions one could order a long wheelbase version V114/115 that came off the standard production line. Mercedes was also willing to provide cars with no roof panel, no boot lid or rear valence and no interior trim aft of the B post called F/FV 114/115 for coachbuilders to base their ambulances or hearses on. Part of the taxi game were versions specifically aimed at the taxi market at various trim levels. If you bought a /8 to full taxi spec you got reinforced seats, heavy duty MBTex seat covers, reinforced door hinges and locks, enormous ashtrays at the top of the rear doors, special interior lighting and an improved heater. How serious Mercedes took the taxi market was illustrated by the fact that Mercedes dealers had the detachable body panels readily available in taxi colour which made small accident repairs very fast. Of course taxi drivers got a taxi coloured courtesy car for the short time their own car was in the workshop for service or accident repair. No wonder they owned this market. W114 six pot versions had double front bumpers before the facelift and the 280/280E had rear bumpers extended forward to the weelarch (and Germany’s only DOHC engine of that time). 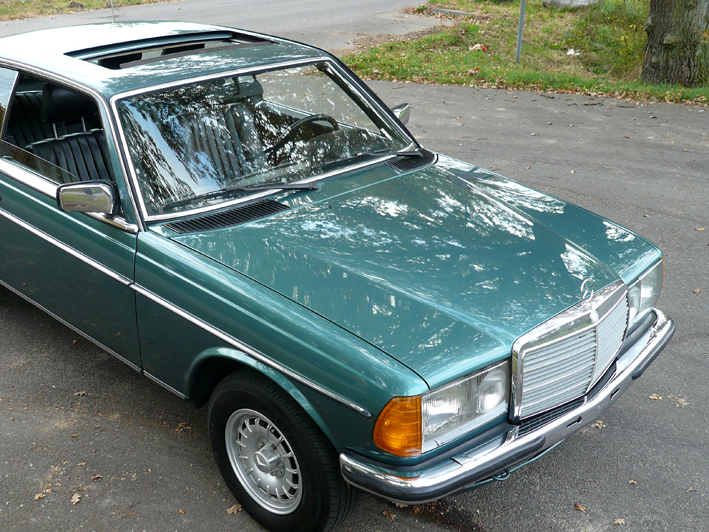 W114s had chrome trim around the door window frames, something the W115s were missing. 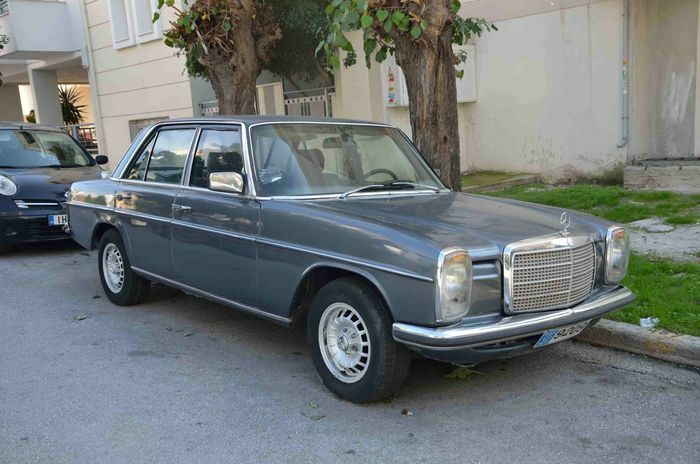 How serious Mercedes took these class distinctions was shown when for a short time they offered a W114 230 120 PS six cylinder and a W115 230 110 PS four cylinder in parallel. They even put “230.4” or “230.6” designations on the boot lid. The Mercedes museum has the world record holder W115 240 D on display with validated 4.6 million kilometres after three replacement engines. A great write up Eóin and great comments as usual. I have a love it / hate it relationship with the looks of these and could never definitively put my finger on why, but all the trim differences mentioned by Vic and Dave do help to focus the mind (I prefer saloon, chrome window frames, single front bumper, short rear bumper). My earliest memory of these is the small blue Corgi model I had as a child, which I think came with a trailer. I accidentally dropped it over the balcony of the block of flats in which we lived, on to the grass below. As it was late at night, my father wouldn’t let me go downe to get it, and by the morning it had gone. Given the nature of W114/5, I have no doubt it survived the fall. I’ve never quite taken to the slightly contrived headlamp treatment, with the twin round units enclosed by horizontal slats that are intended, I think, to look like an extension of the grille. The rubber bumper end caps are a bit clumsy and utilitarian looking. These are only minor criticisms, of course, but the W114/5 is perfection! If you don’t like the W123’s headlamps or rubber bumper ends (and rubber strips in the rear lights) you could always buy a six cylinder version with rectangular lights and full chrome bumpers (and a chrome strip in the rear light). The blue W115’s Fuchs forged aluminium wheels were frighteningly expensive optionals and are very rare. Returning to Mercedes-Benz, the W123 full chrome bumpers are much more in keeping with premium car expectations and the Fuchs wheels are exquisite. I absolutely agree with you that the W123 has some weird design details. I never liked the rubber or chrome inserts in the rear lights. What were these meant to do? What’s the purpose of a strip of rubber in a rear light lens? The W123 was much less modernist than Paul Bracq’s designs that made even a monster like W100 (Mercedes 600) look somehow acceptable. For me, Bracq’s efforts for Mercedes were much better than his later work for BMW. I’d like a W114 280E saloon. A wonderfully understated car and astonishingly fast for the time even if it was noisy and had a healthy appetite for fuel. Or a 200 D with automatic gearbox, the absolute nightmare as the car in front of you. With an acceleration time of one full minute from standstill to 100 kph and a top speed of around 110 kph they drove everyone mad and covered everything in thick clouds of fatty soot. These discussions are so funny! I have never even noticed those inserts, either in the front or rear, and I grew up with a W123 as the family car in the 80’s. Never even noticed them! I can’t speak for the front lights, but the rear lights seem a question of framing. The black rubber strip surrounds the aperture, making for a much more substantial look. It gives the impression of solidity and grounded strength. Take it away and the rear would look naked and insubstantial. The strip makes a ledge that the rear lights are visually resting on, without it the lights would have nothing to hold on to, so to speak. Besides the taxi market and the petite bourgeoisie, and never has there been a single car more bourgeois than the stricht acht, there’s also the peculiar self employed contractor market. In the 70’s, there weren’t that many cars that were a viable and practical proposition for people who would only shop a diesel powered car. There were the Mercedes diesels and the Peugeot diesels, and that was pretty much it. Citroen had no diesel until the CX, Renault none at all. No such thing from VW and Audi until the Golf diesel. Ford survived on a trickle of indenor units from Peugeot. The only upspring was Opel that launched a diesel of their own for the Rekord in 1972. In Sweden, and I guess a lot of other markets at the time, there was a punitive tax on gas. But there was a loophole, the value added tax was deductible for contractors using gas in their line of work, and if you owned a diesel powered excavator or whatnot, nobody would know if you cheated the system and filled your car with subsidized gas. What it actually meant in practise was that it lowered the cost of gas with 25% making a diesel powered car a very viable proposition for those people, and most of those self employed contractors were running a Mercedes in those days. Like the W123 that followed, the /8 was beloved family transport to many at the opposite end of the pecuniary scale long after the bourgeoisie had traded up. These vehicles are still sought-after by those demanding reliability and dependability. Shame the hipsters are also discovering them.. I just learned from Wikipedia that Paul Bracq also worked on the TGV high-speed train. Roger Tallon produced proposals too, but « The Man » was Jacques Cooper. He worked at Renault, Frigidaire (a GM subsidiary..), Brissoneau & Lotz for some time, working on numerous projects for Renault! Most famous for the first TGV set, Jacques is relatively unknown outside France, Bracq and Tallon sharing the limelight at once rightly but somewhat unjustly. I’ve always loved anything with Bracq’s fingerprints. His Pagoda and E24 shark are my favourite of his designs. The 114/115 was a slow burner in my eyes, I didn’t appreciate it at first. Now it’s calm looks and beautiful headlights appeal strongly and I’d take a coupe over a C123. I think most of the work he did on the TGV was on the interior. He also spent a decade at Peugeot as head of interior design before retirement. He still sketches and judges at car shows and he and his family run a business restoring and selling Pagodas in his home town of Bordeaux. As a former Mercedes club member, I had a vain hope I would own one but could never choose one that suited the class I strived for with the budget I (didn’t) have. Any road, on attending one club meeting at a very nice country hostelry, many three pointed stars showed up for the Show & Shine evening. SL’s to the fore, sprinkles of SLK and 123 but then a stately blue Stroke 8 drew in. I just stopped, open mouthed. Taking pride of place in the car park and promptly taking that nights prize (more polish and a wee trophy) I was later introduced to the owner. Step forward one very proud, understated and forthright Yorkshireman who was known to all as Chip Shop Barry. He’d bought it as what looked like a sound car but naturally on further investigation, framework concerns were significant. He wouldn’t reveal the amount spent but I think he had to sell a lot more chips. But this lucky fellow now has a very rare machine, a handful in the club and not many more otherwise. I’m surprised no-one has mentioned the W124, the successor plus one to the Stroke 8. But I agree with almost everyone here that the W114/5 (50 years old!!!) is a masterful piece. And even here in Canada, they’re seen on occasion out in the wild. Sadly, most seem to have the horrendous 5 mph bumpers that appeared in North America for the 74-76 model years, and I’m hard pressed to think of a more crude and inelegant solution to the regulation than these. Hello Peter: thanks for dropping by. I am on the DTW nightshift, surrounded by CCTV monitors showing developments in automotive design, empty cofee cups and Simon Kearne´s empty sherry bottles. Richard, I have been lurking on the margins of your site for some time now—don’t recall how I stumbled upon it, but it’s always a delight and I think back to your views whenever I see such excruciating styling excretions as Toyota C-HRs or Civic hatches drive by. And they’re only the worst of a bad lot, IMHO. I´ll have to disappoint you. The CH-R (or whatever) is so-off-the-scale that I really like it. Toyota went the whole hog and didn´t let up. It offends loads of my design principles and I´d never buy one. However, it is exactly right for its chosen sector and on its own terms is properly executed. I only wish it was a three-door and not a faux five door. There´s my objective view and my personal view. The Toyota is not for me but spot on and well done for its customers. The Civic is a monster though because it isn´t well executed and it offends everyone. What a pity because Honda used to have a nice line in neatly tailored cars, big and small.